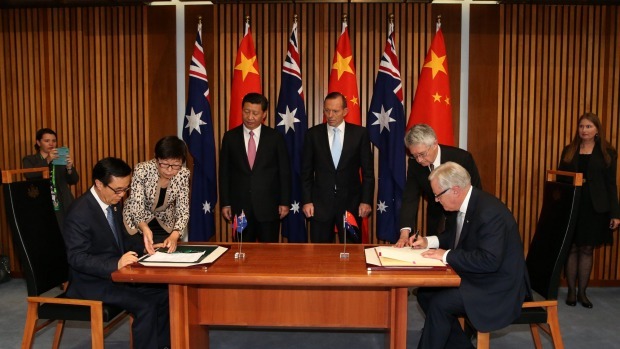 the Signing of the Declaration of Intent on the Australia/China Free Trade Agreement. A detailed analysis of the proposed Australia-China free trade agreement finds it benefits Chinese investors more than Australian ones. 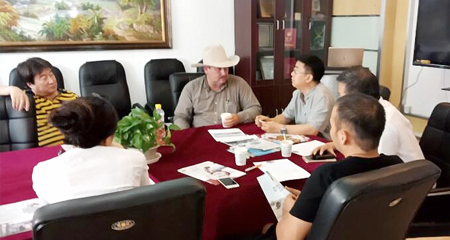 Conducted by the Australian Fair Trade and Investment Network and limited to the investment chapter and investment facilitation agreement, it finds that whereas firms with Chinese ownership can bring in Chinese nationals to work in Australia there is no equivalent provision for Australian firms to bring in Australians. Australian firms are limited to importing senior managers and specifically skilled workers. The Chinese provision applies to project companies with at least 50 per cent Chinese equity or, where no single enterprise has 50 per cent equity, to a project in which a Chinese firm holds a "substantial interest". A substantial interest is defined as occurring when a single foreign person owns 15 per cent of a project or several foreign persons and associates own 40 per cent. The project must be related to infrastructure development in food and agribusiness, resources and energy, transport, telecommunications, power supply and generation, environment or tourism. The minimum wage to be paid to imported Chinese workers will be the subject of negotiation between the project company and the immigration department rather than being the Australian minimum. Whereas Australia is subject to a general provision preventing discrimination against Chinese investments, China does not have this general provision and is only required to not to discriminate against investments in the particular sectors of transport, tourism, hospital, aged care, education and financial services. The investor-state dispute settlement clauses in the agreement are less open than the provisions in other agreements, including the Australia-Korea free trade agreement, not being subject to a requirement that the dispute hearings and associated documents be made public. They are unfinalised, being subject to a review in three years time. "The lopsided market access and the failure to finish the negotiations look as if the Australian government was desperate to seal the deal at any price, and that China was successful in defending many of its existing limitations," said Network co-ordinator, Patricia Ranald. A spokesman for Trade and Investment Minister Andrew Robb said the inclusion of investor-state dispute settlement procedure in the agreement was not new. Australia and Chinese investors were already subject to such procedure under an existing investment treaty.